Q. What's a Data Management Plan (DMP)? A data management plan is a live document that outlines how you will handle your data during and after your research. The QUT DMP Tool is a resource to help you develop your own data management plans. The DMP template used is based on a model created by the UK's Digital Curation Centre. Not all fields will be relevant to your project. Some fields relate to the active stage of your project and some refer to after the project is completed. Required or mandatory responses are indicated by an asterisk (*). Review your plan at least every 12 months throughout the course of your project. If you are a Higher Degree Research (HDR) student, your data management plan should be prepared in conjunction with your supervisors. Q. What about other funders? Other funders such as Australia's National Environmental Research Program (NERP) the US National Institutes of Health and the UK Medical Research Council require research data to be openly available to speed translation of research results into outcomes that improve human health. Q. Why do I need a data management plan? To be high quality, data must be well managed. A data management plan documents how data gathered or generated during a research project is organised and stored, and how it will be archived, shared and published. 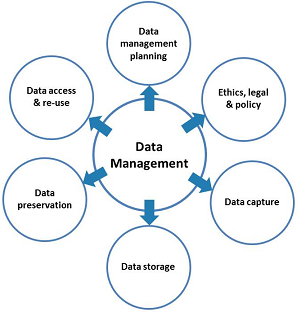 Effective data management planning is required by the Australian Code for the Responsible Conduct of Research, the QUT Management of research data policy (D/2.8) and the QUT Records management policy (F/6.1). Compliance with the Code is already a requirement for Australian Research Council (ARC) and National Health and Medical Research Council (NHMRC) funding. If requesting research data storage, a data management plan is required. Q. Is my data management plan private? The information you enter into a data management plan can be seen by you, people you have chosen to share it with, and system administrators. The Technology, Information and Library Services (TILS) Research Support Administrators currently report anonymised usage statistics, such as the number of users, plans, and revision dates for plans. Your metadata will not be accessed, made use of, or shared with third parties unless you give permission for such activities to occur. Q. What are the benefits of having a DMP? The DMP can also be used to create metadata for data sharing in QUT's data repository, Research Data Finder. Researchers can get recognition and impact from the data that they've worked so hard to create or collect. Researcher profiles increase due to exposure and citations for the reuse of your data. All QUT Higher Degree Research students, as well as publicly funded research projects, require a data management plan. The QUT DMPT helps you to plan ahead to create high-quality shareable research data. A data management plan is also a QUT requirement for research storage requests, as well as Australian Competitive Grant (including Category 1) grant applicants planning to create data during the course of their research. Q. Do Australian funding bodies require data management plans? Both NHMRC and ARC have requirements for data management and planning in their applications for funding. Funders and publishers frequently mandate researchers to share data. Although the NHRMC and ARC do not presently mandate open data, researchers are encouraged to describe their arrangements for the future access and re-use of data. The ARC funding rules for 2014-5 state "Researchers and institutions have an obligation to care for and maintain research data in accordance with the Australian Code for the Responsible Conduct of Research (2007). The ARC considers data management planning an important part of the responsible conduct of research and strongly encourages the depositing of data arising from a Project in an appropriate publically accessible subject and/or institutional repository."